Oil, coal and natural gas represent 80% of global energy consumption and all of us have contributed to that consumption. The seemingly isolated actions we take every day are links in a chain of connections that tie to energy use. Coal plant emitting pollution. 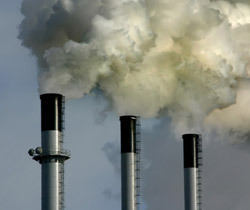 Burning coal is a leading cause of smog, acid rain, global warming, and air toxics. We understand the need to turn off the lights when we leave the house, but most of us are unaware of energy required for everything else we do, from our morning coffee (from South America perhaps? ), to mowing our lawn, shopping at the mall, and the meat on our table for dinner. Just that trip to the mall requires oil and gas for our transportation, and the oil and gas for the production and shipping of every single item, and component of every item, being sold in the mall. The Appalachian region has paid a heavy toll for the development of these fossil fuels. Decades of mining and drilling has led to a rise in methane and greenhouse gases, acid mine drainage and acid deposition, heavy metal contamination, poor water quality and lower groundwater levels. Natural gas and oil production largely employ the process of hydraulic fracturing (fracking), which is the literal fracturing of rock layers to access gas at previously unattainable depths. Fracking opens the door to a range of potential environmental issues. Pipelines and wellheads can explode, toxic gasses are used and released into the air, and contaminated runoff can drain into area lakes and streams, seriously harming water quality, and reducing quantity. Millions of gallons of water are usually needed for one natural gas drilling operation. One of the most serious threats to national parks is air pollution from coal-burning power plants. Mining coal has serious environmental impacts, whether the mining is underground or on the surface. In the most obvious example, mountain-top removal mining has adversely affected soil, vegetation and local ecosystems. Both strip and surface mining completely bury or pollute streams, eliminate existing vegetation, destroy genetic soil profiles, degrade air quality and alter current land use. Heavy machinery and a steady influx of trucks disturbs the soil and generally results in erosion and runoff. Moreover, traffic, soil displacement and general construction strip the land of vegetative cover and create dust, which degrades air and water quality as well. Other mining impacts are less obvious. Mining exposes pyrite, which forms sulfuric acid upon contact with water and air; that acid contaminates groundwater and can pollute local lakes, rivers and streams for miles around. Groundwater can also be damaged by surface mining. As usable water from nearby aquifers is utilized, water levels decline and contaminated mine water infiltrates existing waterways. Where coal shale is present, there can also be an issue with increased runoff and erosion, as well as lakes forming in abandoned (and contaminated) surface mines. Using fossil fuels for energy likewise harms the environment and all of us. Burning coal releases a variety of hazardous gases into the air, including CO2 (carbon dioxide), SO2 (sulfur dioxide) and NOX (nitrogen oxide). One of the most serious threats to national parks is air pollution from coal-burning power plants; it damages forests and plants, harms fish and wildlife, ruins scenic views and can threaten the health of park employees, park visitors and park neighbors across a wide region. Businesses that market scenic beauty, rafting, canoeing and other outdoor activities can also suffer from reduced economic benefits because of air pollution and its impacts. As the pace of energy development increases, it’s up to us to educate ourselves on what we can do in our individual lives, reduce our individual energy usage, research cleaner energy sources, and protect and restore the unique natural beauty of Appalachia for generations to come.